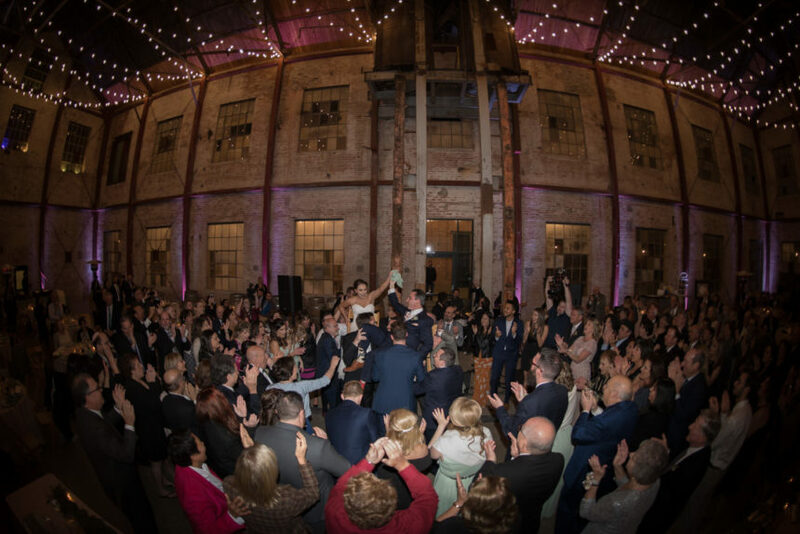 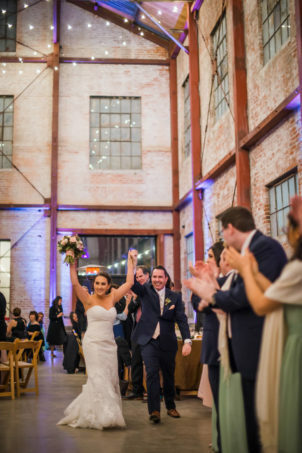 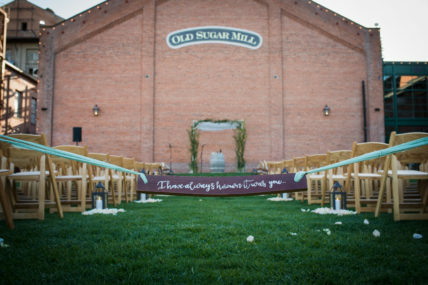 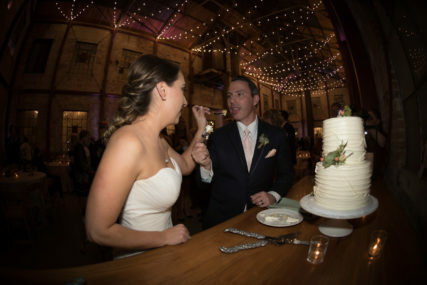 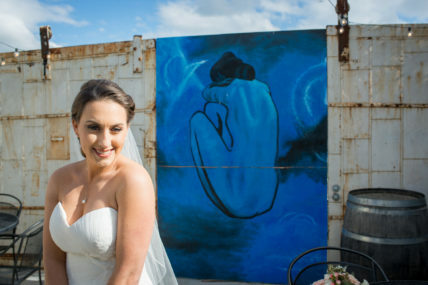 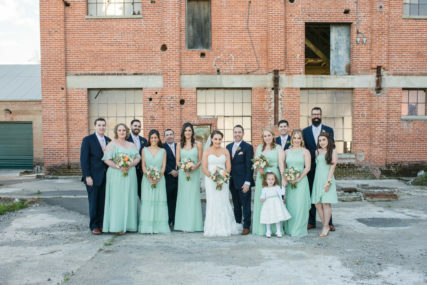 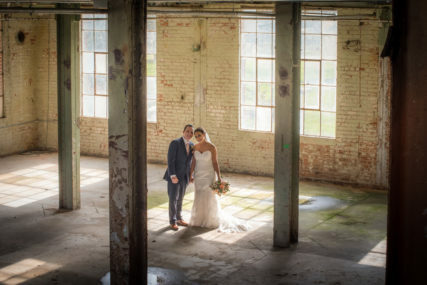 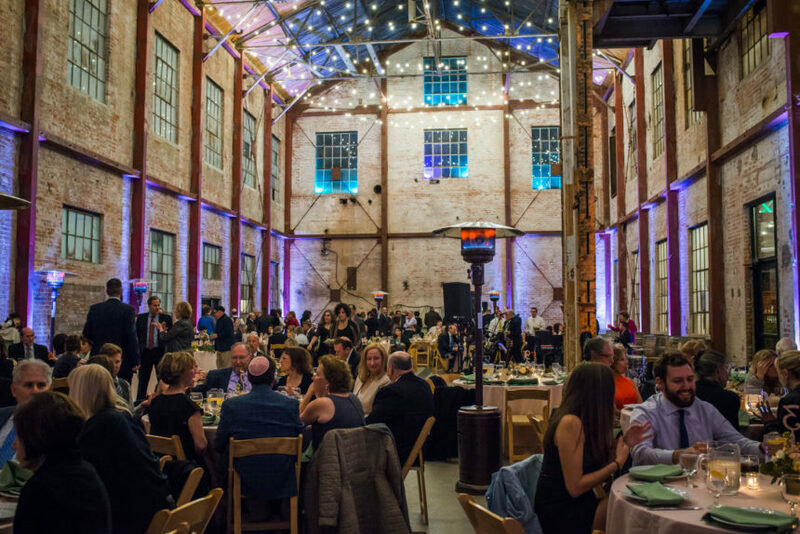 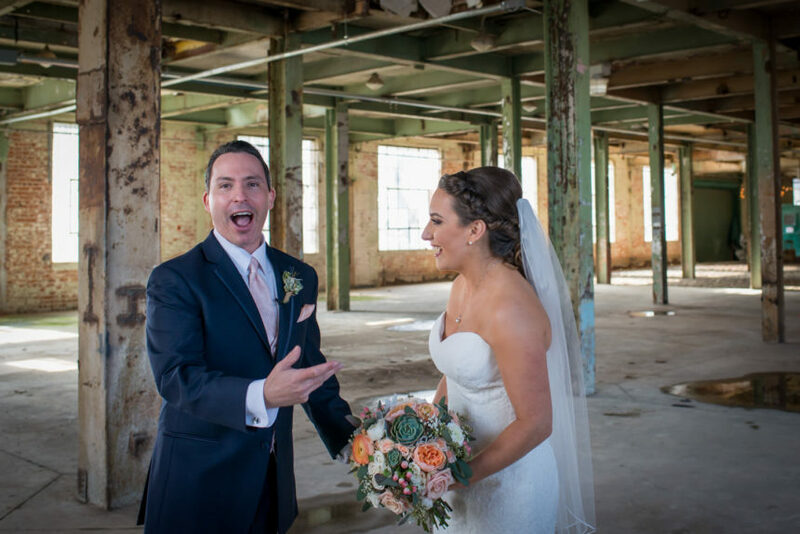 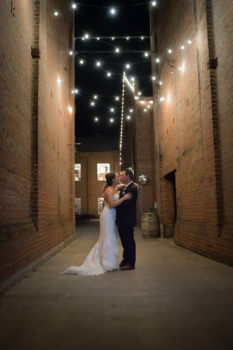 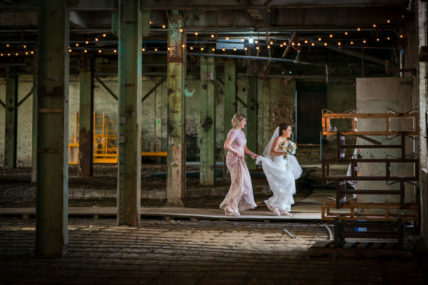 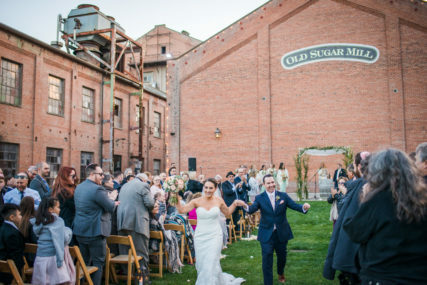 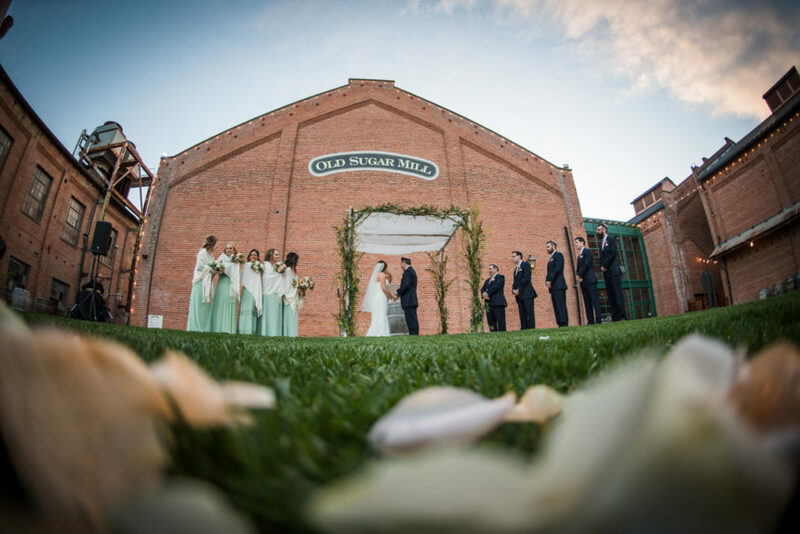 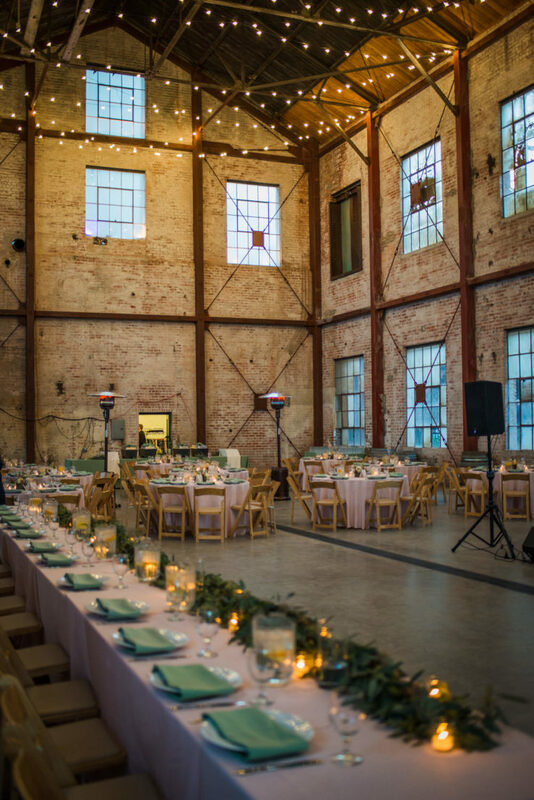 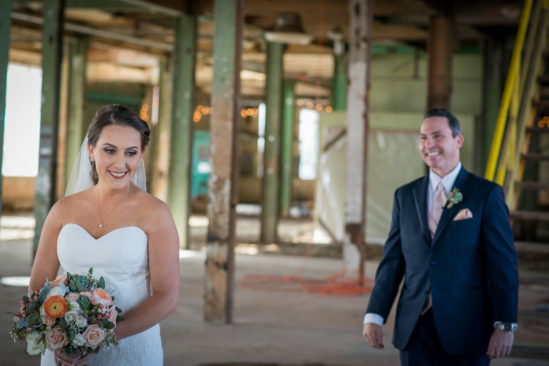 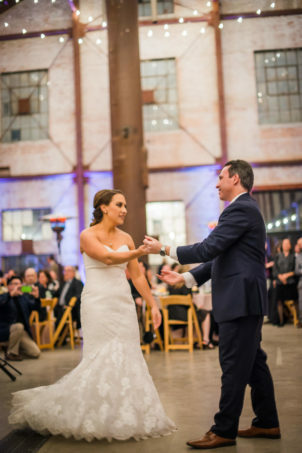 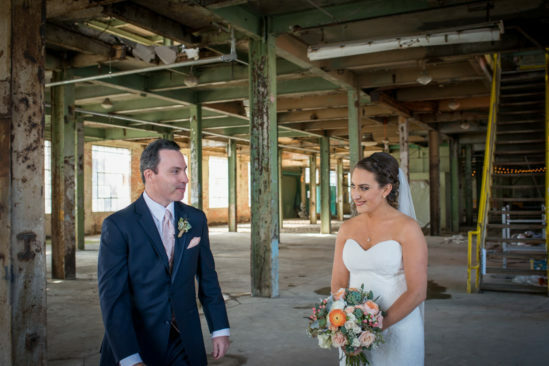 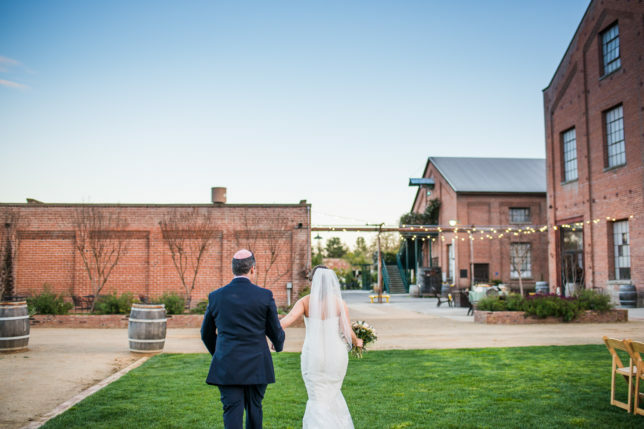 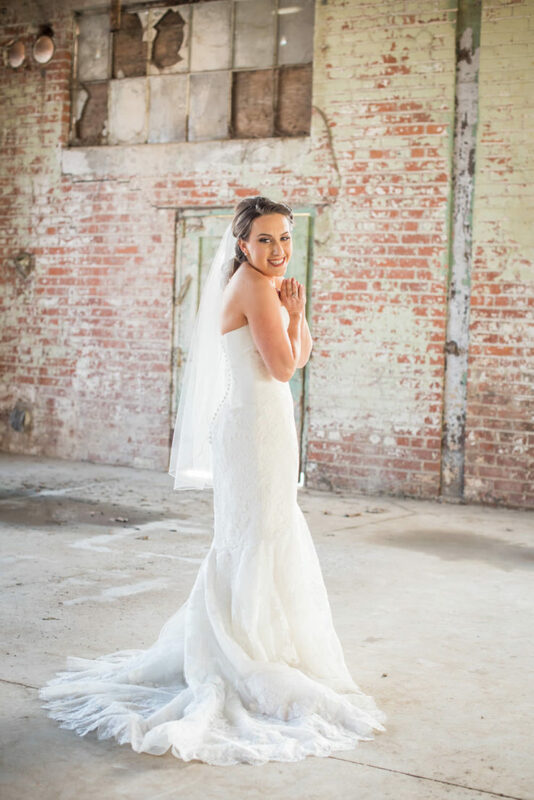 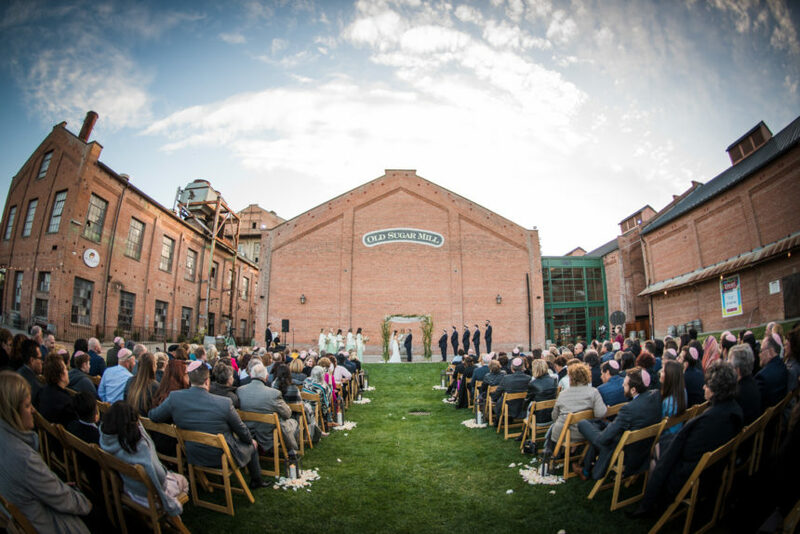 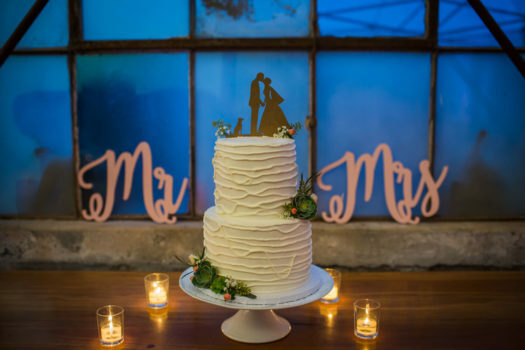 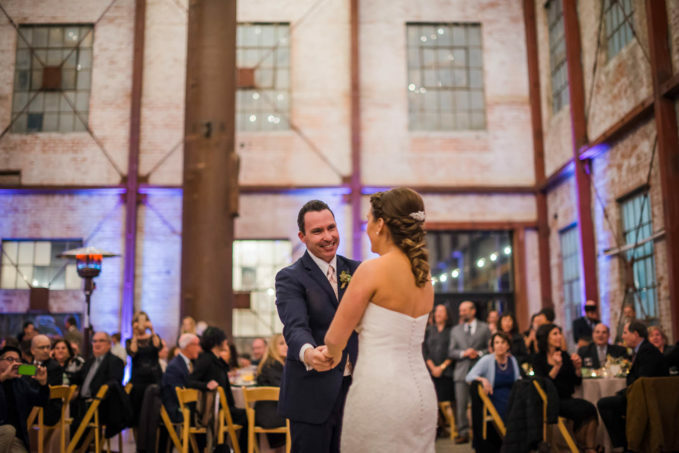 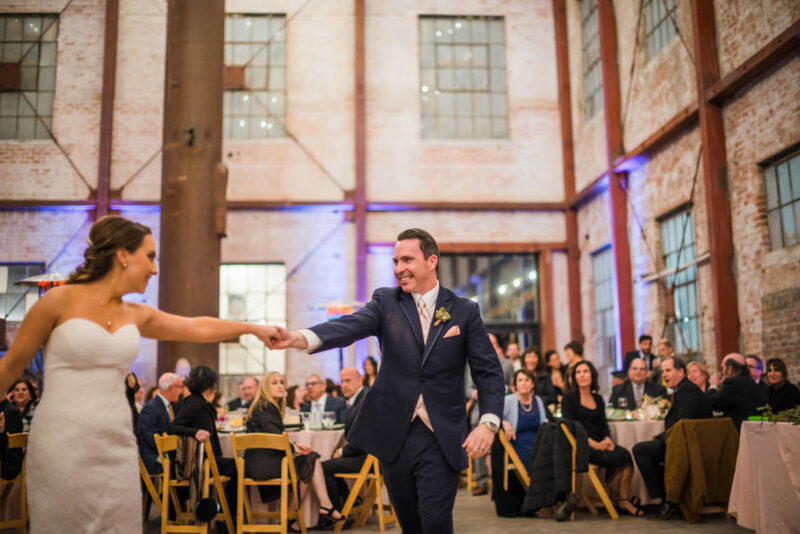 As we are used to Tahoe mountain and forest style weddings we were so super excited to explore this industrial style venue that was built in 1934 and was originally a sugar beet factory. 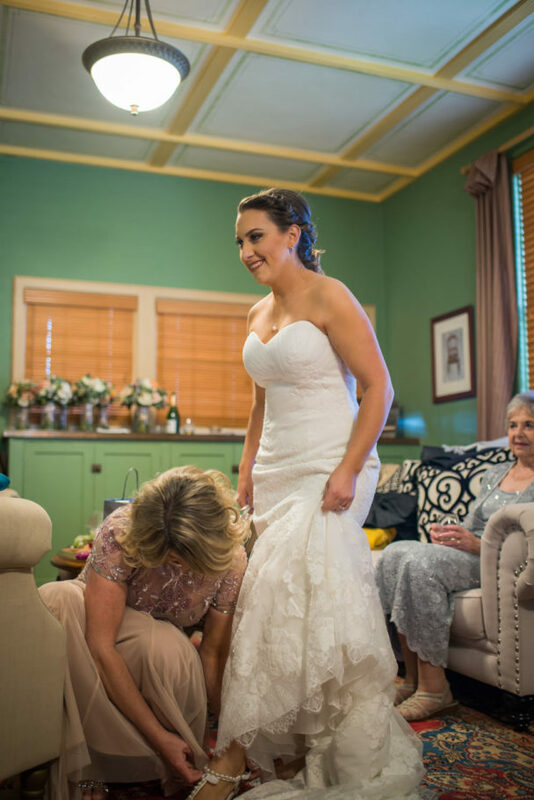 The bride Andrea used to watch our now teenage daughter when she was but just a wee babe. 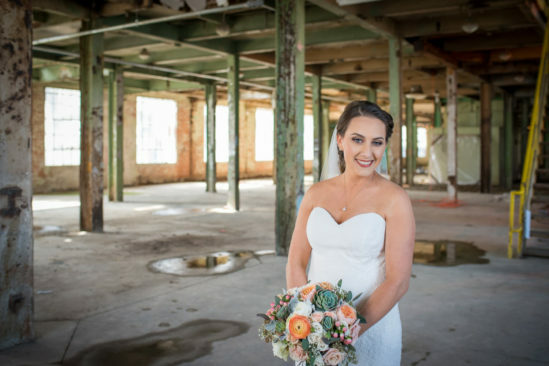 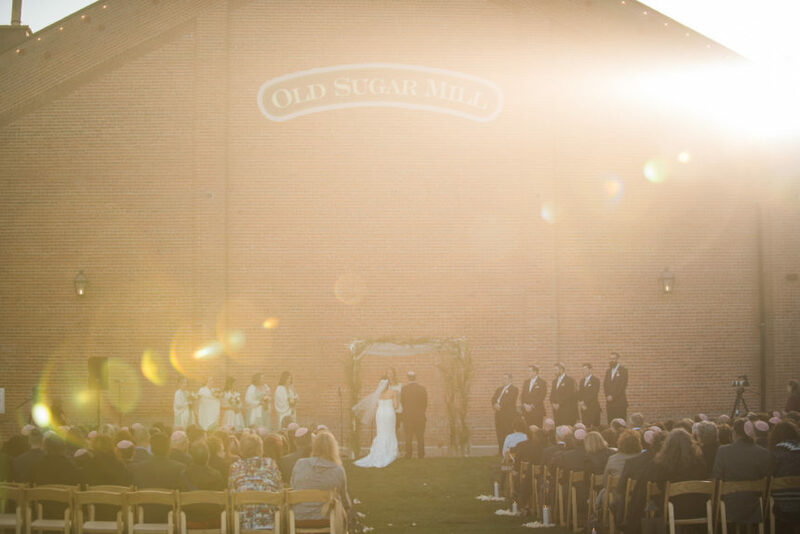 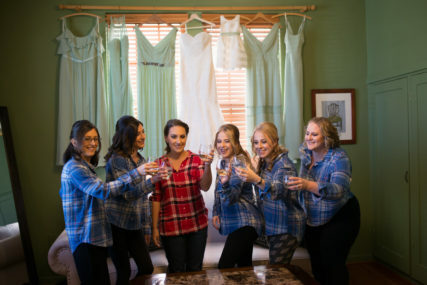 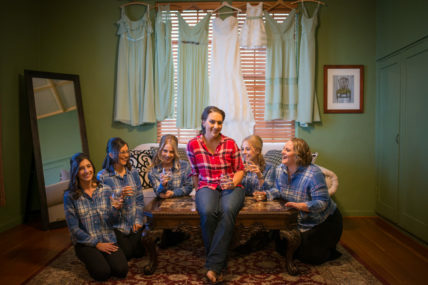 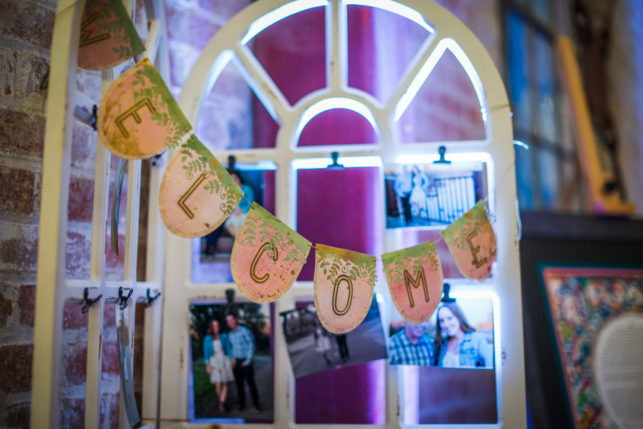 Needless to say we were beyond thrilled and excited when she got in touch once she was engaged to see if we were available to photograph her springtime Old Sugar Mill Wedding. 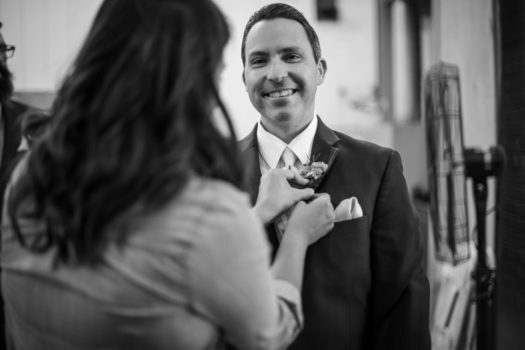 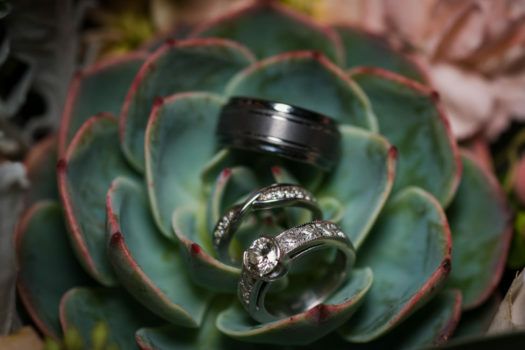 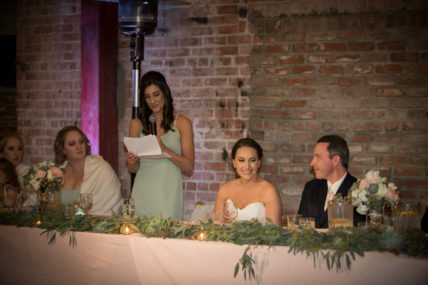 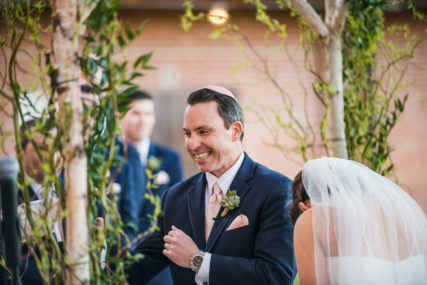 The wedding details were so beautiful and filled with a soft Sage and Blush color palate. 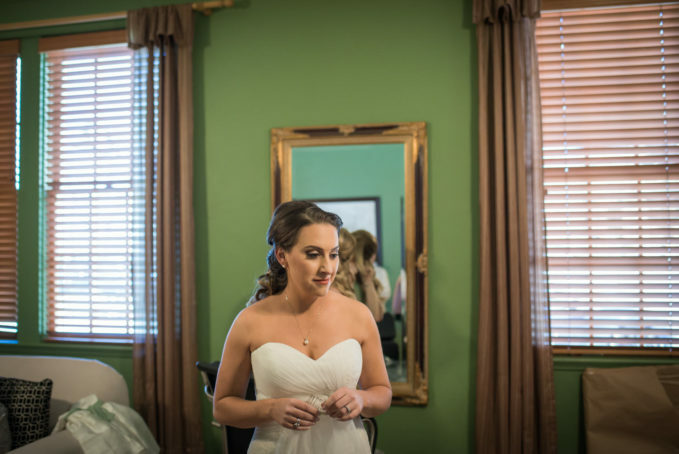 Speaking of which, all of the colors and details that Andrea chose for her wedding day really complimented the surroundings perfectly. 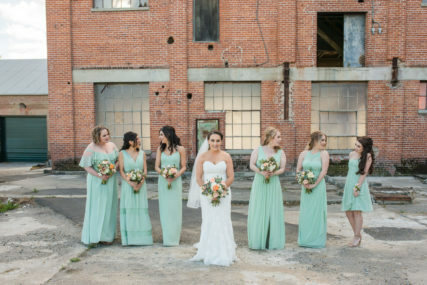 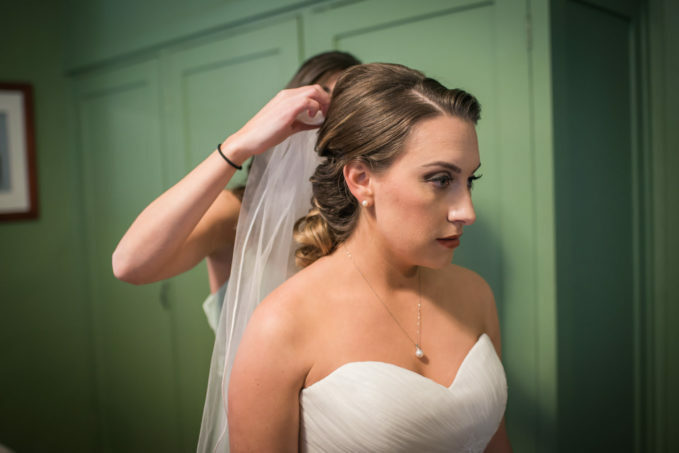 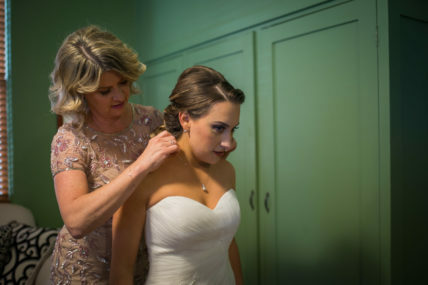 I was half joking that she must have picked the venue specifically because her bridesmaids dress color matched so well that it literally was the same as the bridal changing rooms wall color. 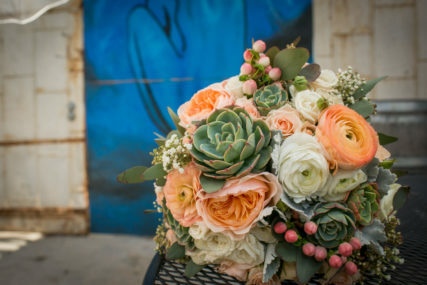 The florals were so soft and pretty and the little pops of succulents matched the dresses as well. 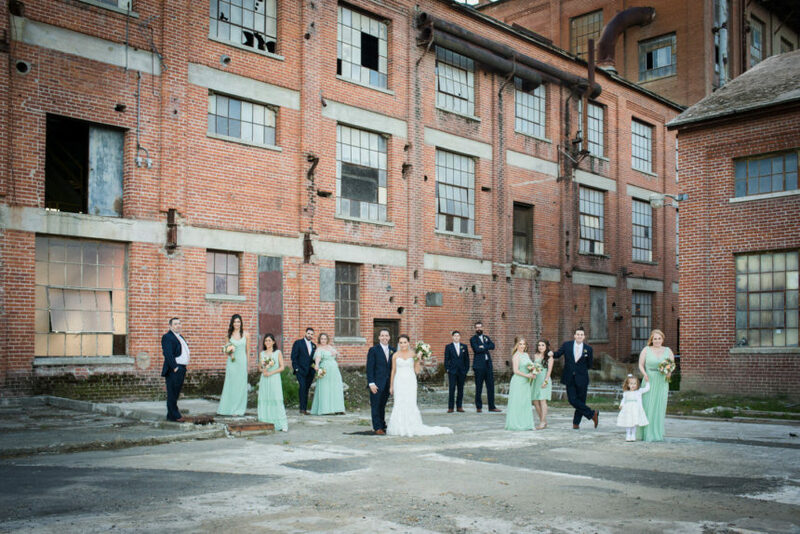 Now let’s chat a little about Andrea’s stunning dress. 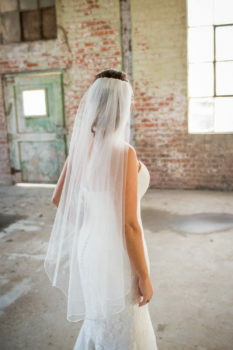 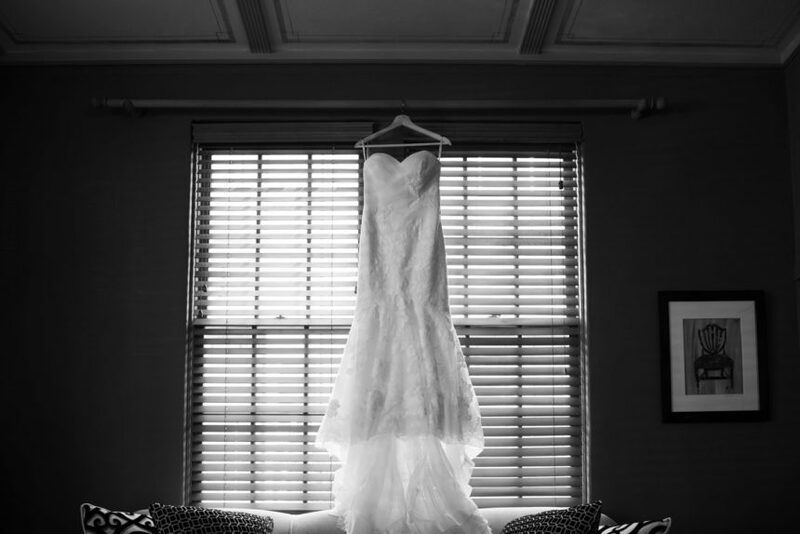 Our bride looked absolutely gorgeous in her lace fitted bridal gown. 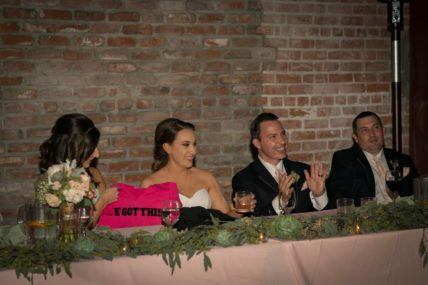 Seriously though, it really looked like it was made just for her and only her. 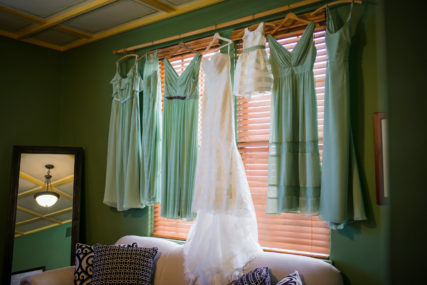 That and I really love how all of the bridesmaids dresses were all different but blended together so seamlessly. 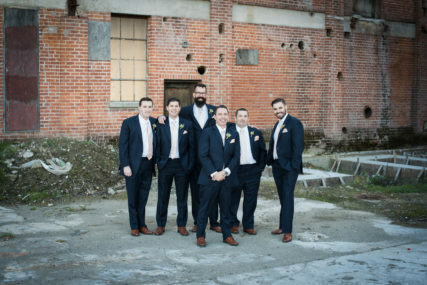 We have to say that we are suckers for a good navy blue suit and Seth and his men really delivered! 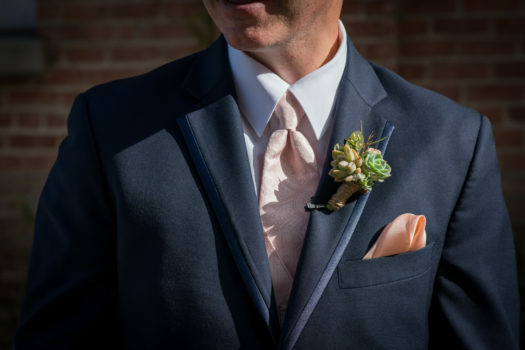 They are looked rather dashing in their blues. 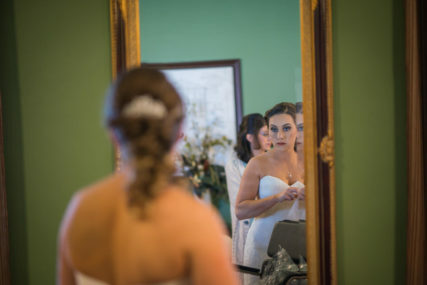 They chose to have a little sneak peek before the ceremony began. 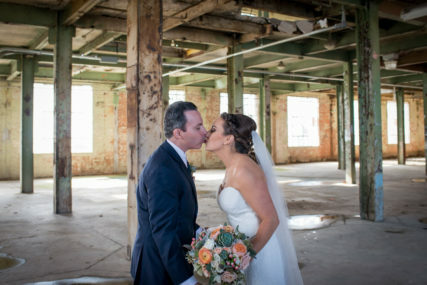 We mutually decided on one of the more industrial of the buildings as it has such amazing lighting. 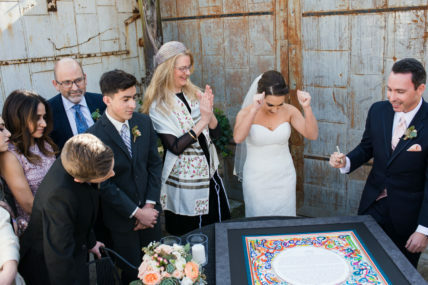 Seth’s mouth was literally hanging wide open upon gazing on his wife to be. 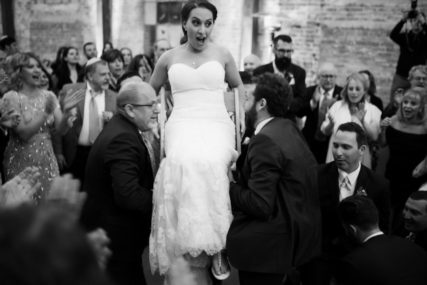 You really could see just how excited they were to get married!! 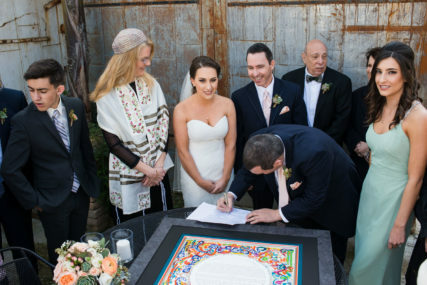 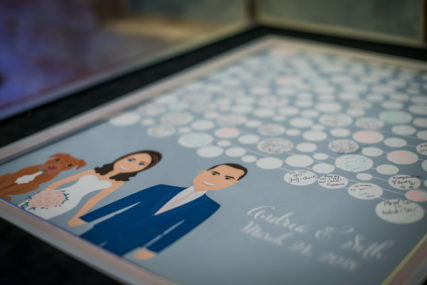 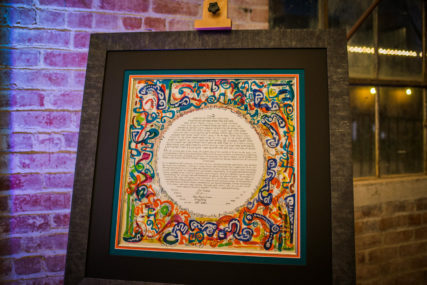 After their little peek unfolded it was on to the Ketubah signing ceremony. 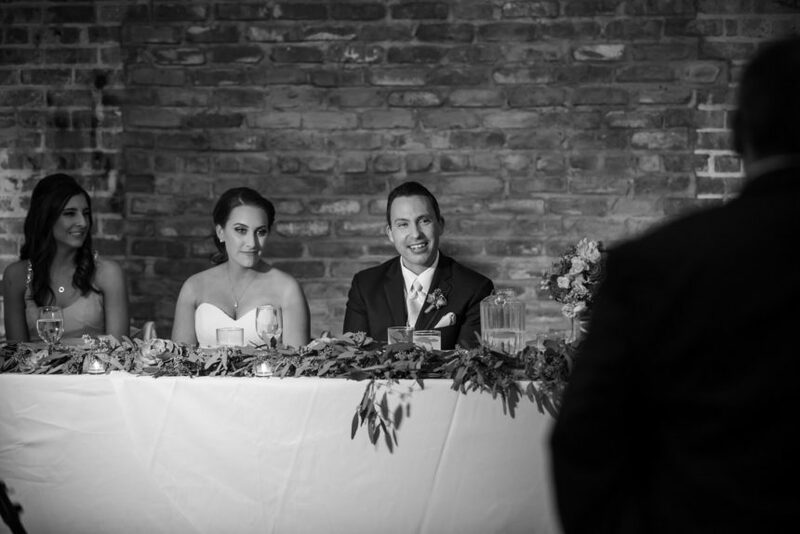 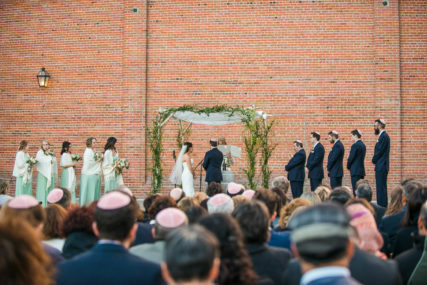 This special ceremony took place only with their close family and friends. 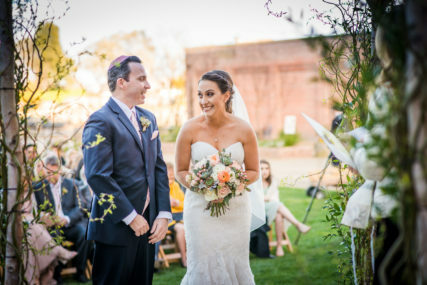 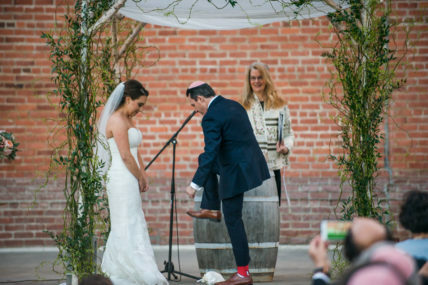 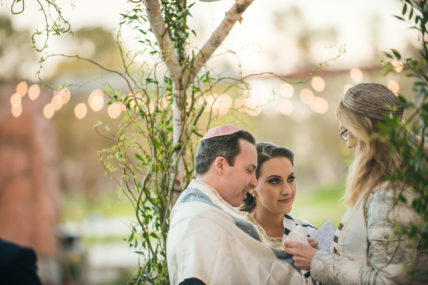 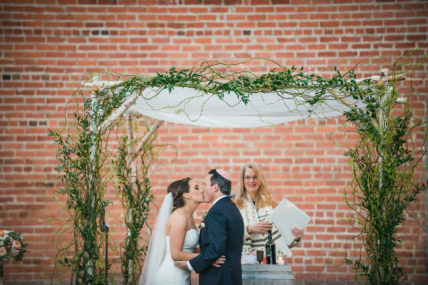 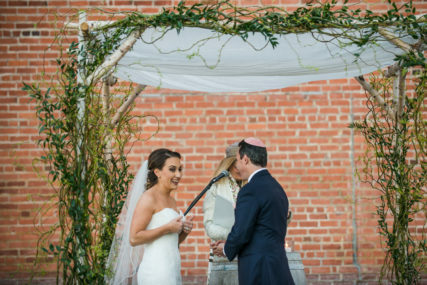 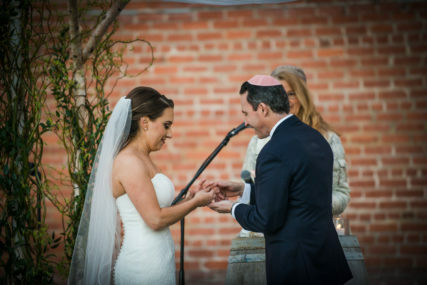 Then their early evening ceremony took place out on the lawn area and incorporated their Jewish heritage. 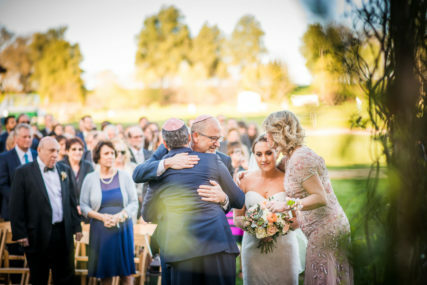 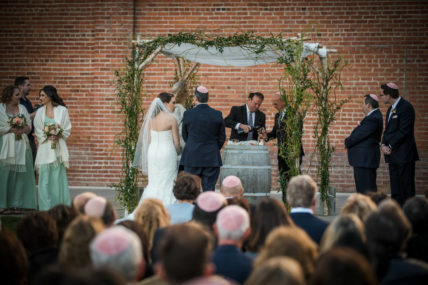 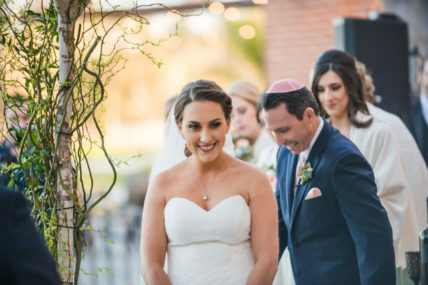 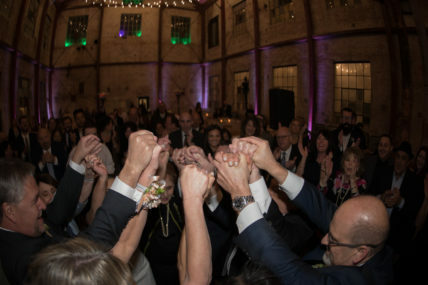 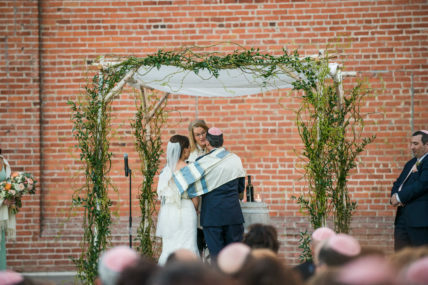 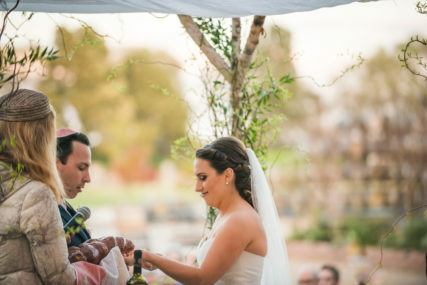 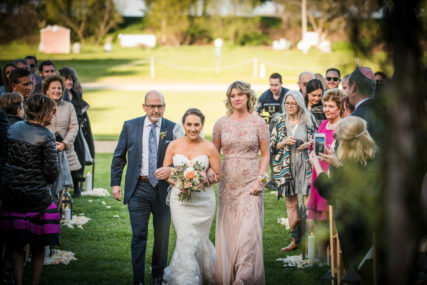 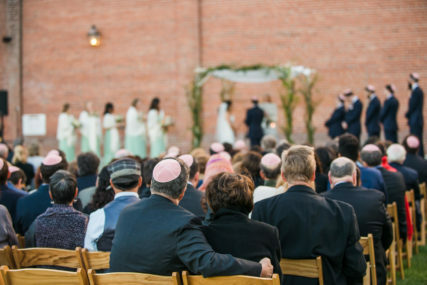 It truly was a beautiful ceremony with traditional meaningful elements entwined throughout which included circling under the chuppah, blessings and the breaking of the glass! 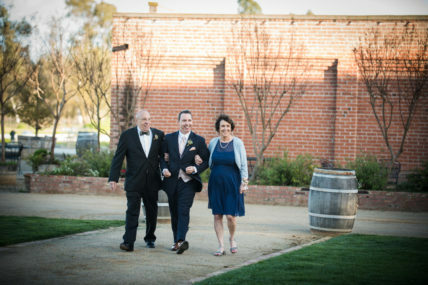 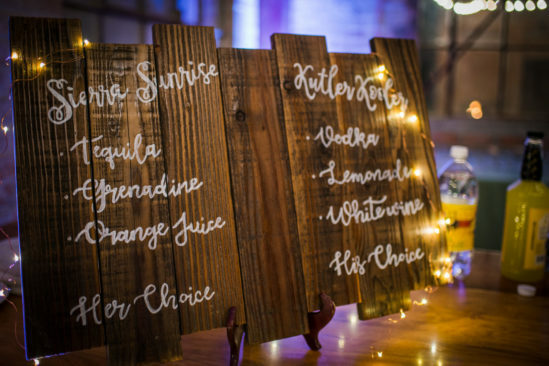 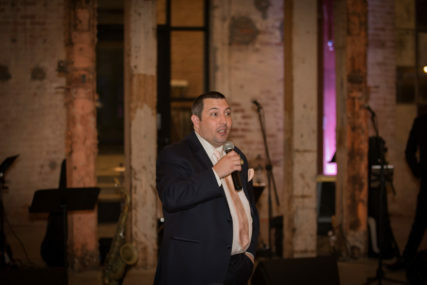 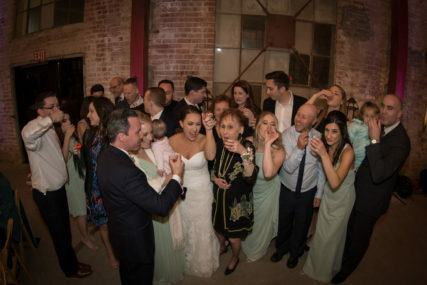 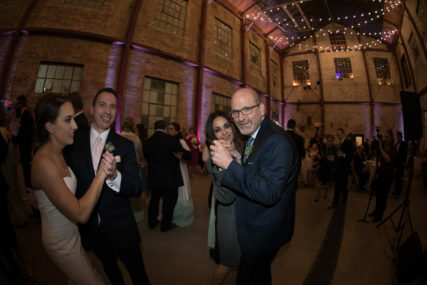 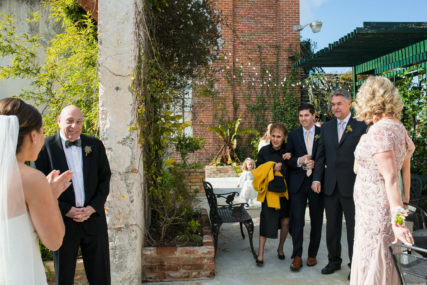 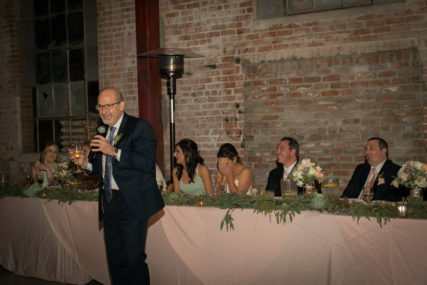 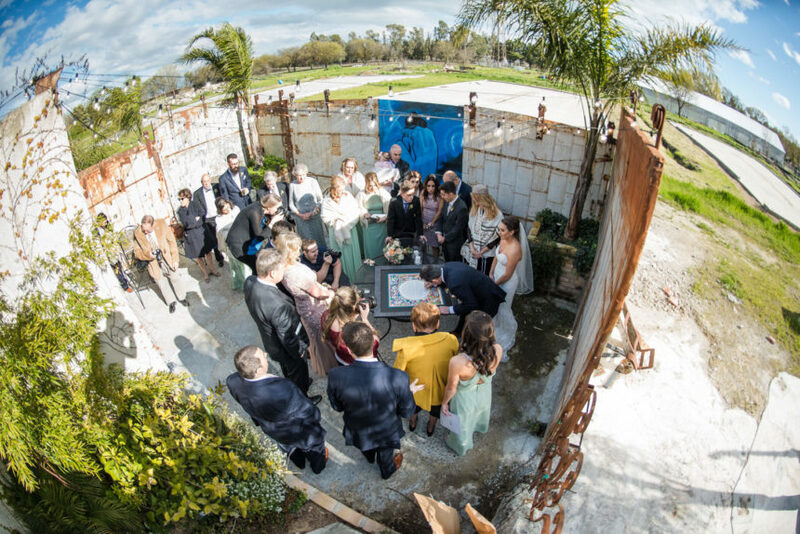 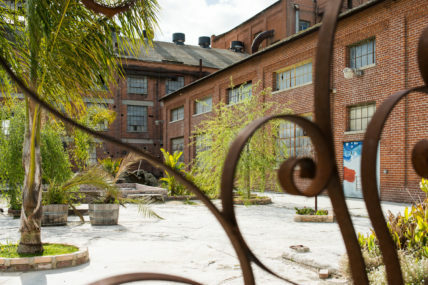 Once the cocktail hour started, the guests were ushered into the old brick boiler room. 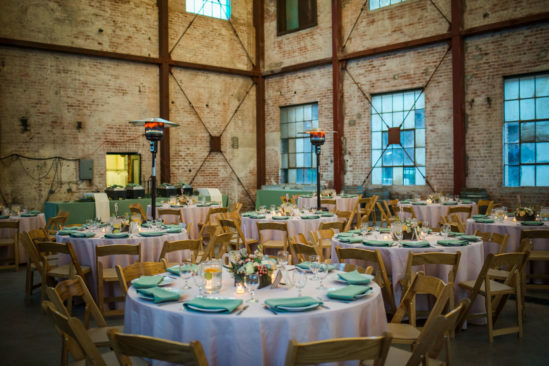 The reception room looked so elegant with it’s up-lighting and string lights and really gave such a dramatic overall ambiance. 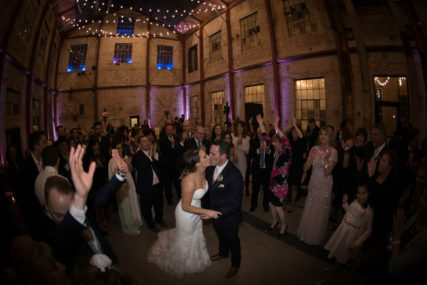 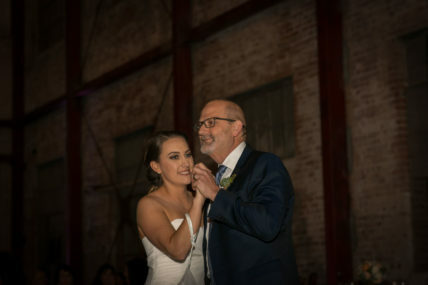 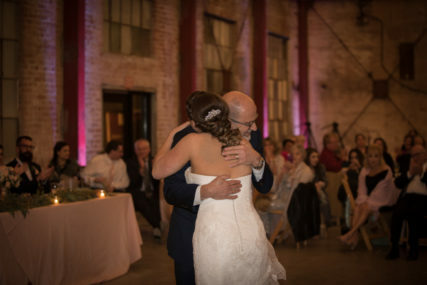 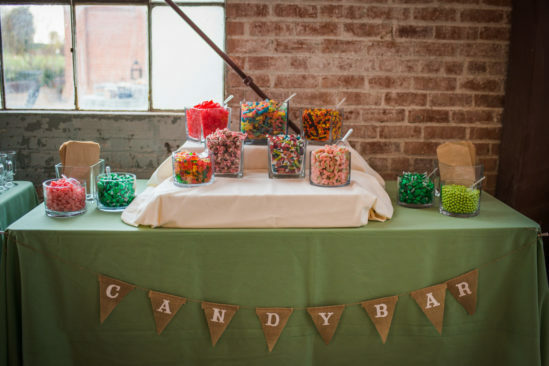 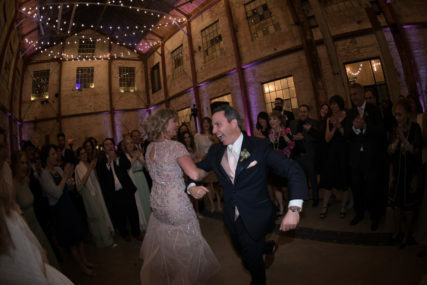 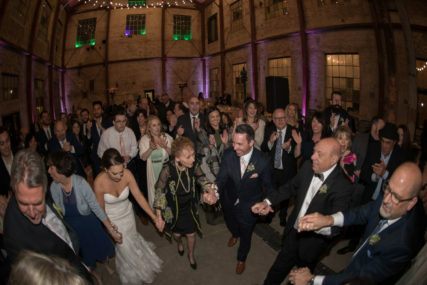 The party was started off by coming in and having their first dance as husband and wife to a live band. 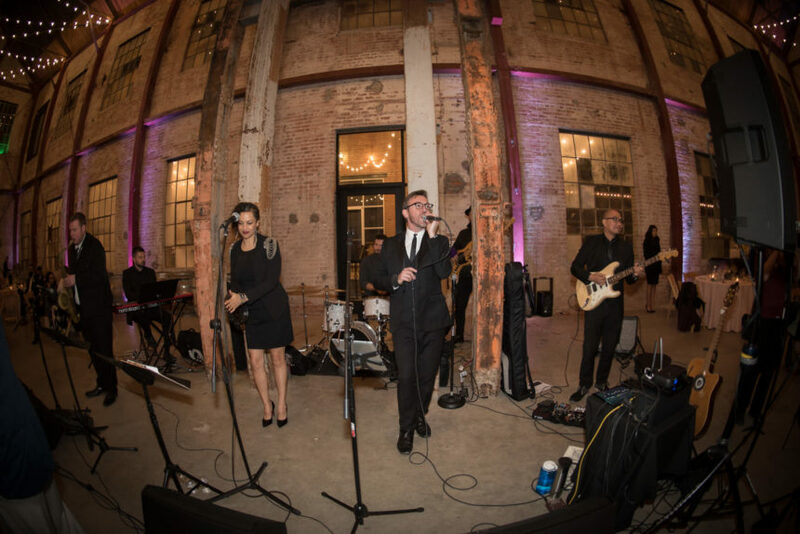 Gotta say there really is another dynamic at play when there is live music at a wedding. 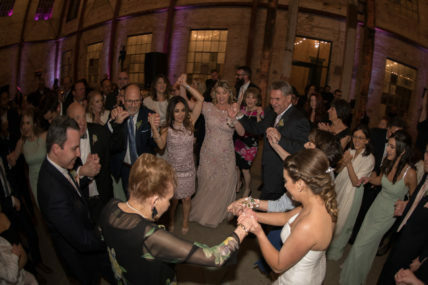 They then invited their guests to join them on the dance floor before starting in on a horah dance in which the bride and groom were eventually lifted into the air on chairs. 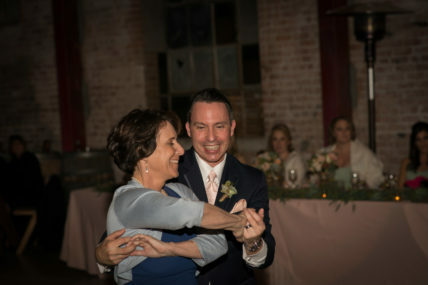 Needless to say this really started the party off in high energy and the evening continued in this fashion. 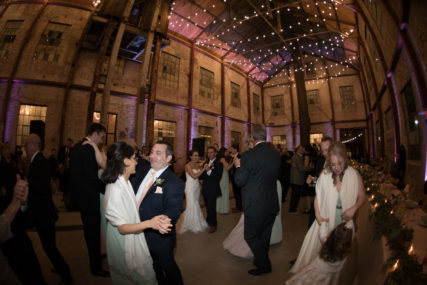 Dancing the night away to a band underneath glowing twinkle lights is our idea of a really perfect evening.